This post contains spoilers for Borderlands 2. Which is weird, right? Borderlands 2 hardly has a story at all, let alone one worth caring enough about to be spoiled. I remember people complaining about the terrible ending of Borderlands and being perplexed: “Really?” I thought. “You cared enough about this story to be upset by a terrible ending? I don’t care about Borderlands 2’s story at all, and neither did I care about the story of the first game. 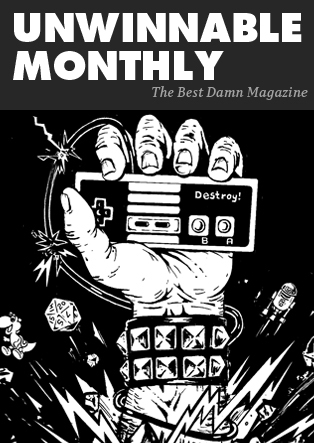 But that hasn’t prevented me from enjoying the sequel for nigh on 30 hours now. What little story there is just acts as the thinnest veneer of explanation for why I am shooting up the places I am shooting up, and why I am collecting the things I am collecting. Really, I don’t care about the story at all. I just want to use the cool guns I have to find more cool guns. That is all there is to Borderlands 2, and that is enough. But the thing is, Borderlands 2 doesn’t care about its own story, either. The game couldn’t care less about its own world or characters, and it goes out of its way to show me just how much it doesn’t care. In fact, Borderlands 2 almost wants to prove to me that it somehow cares even less about itself than I do. Which is silly, because I don’t care at all. The game doesn’t, that’s for sure. It will happily just kill off its own characters as though they are nothing and not think twice about it. It does this, I think, to poke the player. To try to force me to admit that I care about these characters, whether I want to or not. And, well, I think the game is right. As much as I hate to admit it, I do care about some of these characters. Not because either Borderlands 2 or Borderlands has particularly good (or even mediocre) plots, but simply because I invested so much time and effort into them. I played the first Borderlands for about 100 hours. Regardless of how much I didn’t care for its plot, I was invested in its world. That Borderlands 2 would then treat this world and its people that I have an investment in so irreverently was simply… disturbing. But for many hours in Borderlands 2, I couldn’t quite figure out what was happening. I couldn’t figure out how, despite my apathy for this game’s plot, the audio diaries and their sadistic tales of violence were unsettling me so. I don’t care. So why am I finding myself caring so much? I finally figured it out when Bloodwing’s head exploded. 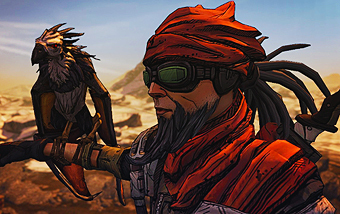 Bloodwing is the pet hawk of Mordecai, one of the playable characters from the first Borderlands. In fact, for me, he was the playable character. When I play RPG-esque games, I don’t play the game over and over with different characters, exploring how the game changes with their different skills. I play one character until they are absolutely maxed out and everything in the world is accomplished, and then I never touch the game again. In Borderlands, the character I did this with was Mordecai. Mordecai, who has Bloodwing sit on his shoulder and, with a tap of the left bumper, sends him off to destroy several bandits in one swoop. I spent a hundred hours with Bloodwing and Mordecai. I was invested with them. 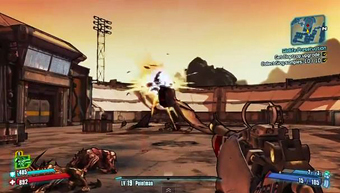 In Borderlands 2, the first game’s vault hunters are still around as central plot characters. In one mission, Mordecai-who-isn’t-me explains that Hyperion kidnapped Bloodwing, and I need to get him back. Except, when I find Bloodwing, he has been mutated into a giant, monstrous version of his former self, and I am forced to fight him. Mordecai is on the radio, beside himself with shock and panic, at what they have done to his companion. As I open fire, I feel the same anxiety, but it’s not the evil corporation, Hyperion, I am disgusted with – it is Gearbox Studios. How could they do this to one of their own characters? Surely, surely, they won’t let this fight end in Bloodwing’s death. But then it does. I successfully weaken the crazed Bloodwing and Mordecai shoots him with a tranquillizer so we don’t have to kill him. But then the explosive collar around Bloodwing’s neck explodes, popping the mutated, tortured bird’s head in a splat of cartoon blood. I am shocked. This character I have spent well over 100 hours with is killed off, just like that, without reverence or respect. No dramatic cutscene. No emotional music. Just an exploding head. That’s it. It makes me feel sick. Borderlands 2 took my claim that I didn’t care about this game’s story and called my bluff by caring far less about itself than I ever could. The game didn’t care about Bloodwing, just like it doesn’t care about any of the characters it kills off. It will happily destroy everyone and everything in its own world just to force me to admit that, yes, I do care about this stupid story. Well, you win, Borderlands 2. You broke me. Despite my best efforts, I do care about you.